Thanks to Jesse Bernad, these two sports involving mitts, shortstops, bats, ground balls, and a playing field called a diamond—is back. A star pitcher at the UP Cebu College, Jesse opened “Fastball Batting Cages” at the Aboitiz Sports Field (at the reclamation area, beside Makro) last November to fulfill his lifelong goal of constructing a “Field of Dreams.” Since then, hundreds have trooped to swing, to throw and to score homeruns in a real softball game on a real baseball diamond. “Perhaps unknown to most Filipinos, the recently-concluded World Baseball Classic (WBC) confirmed to the world that Asian baseball is a force to reckon with. The three-week-long event between 16 nations—baseball’s answer to football’s World Cup—finished with Japan beating South Korea in an extra-inning final to defend the title they won three years. “The Japanese, as expected, beat the US in the semis. For Korea, besting one of Latin America’s powerhouses (Venezuela) in the semis was an achievement. In the end, Japan and Korea outshone the world. What does this say? It means that there is a popular team sport that Filipinos are missing out on. After all, baseball, unlike basketball, doesn’t need height and heft to excel. If the Japanese and Koreans—similarly-built like us—can do it, why cant we? “Baseball was introduced to Filipinos much earlier than our Asian neighbors. In the early 1900s, Americans played baseball with their Filipino allies. Major League legends Babe Ruth and Lou Gehrig of the New York Yankees came to the Philippines to show their talents to us. In the mid- to later part of the 20th Century, we competed against Japan for supremacy in Asian baseball. “Sadly, today, the state of baseball in our country—and in Cebu—is ailing. Look around the city and see if you can find a baseball diamond or kids playing. Nada! The interest in baseball and softball by Cebuanos has awakened since Fastball Batting Cages opened last Nov. 15, 2008. To date, Fastball has received hundreds of customers wanting to try the batting cages. Corporate groups have tried this outdoor sport. And, with the Mobile Cage Roadshow, Fastball has been popular during Family Days and Sports Fests at schools. “With these initiatives, the sport today has become more fun for Cebuanos. Parents, children, teenagers, students, middle-aged professionals, and even the older age group—the entire family—now get to play baseball. Even more, not wanting to just stick to batting, Fastball Batting Cages has moved on to another level by organizing weekend tune-up games that are open to the public. 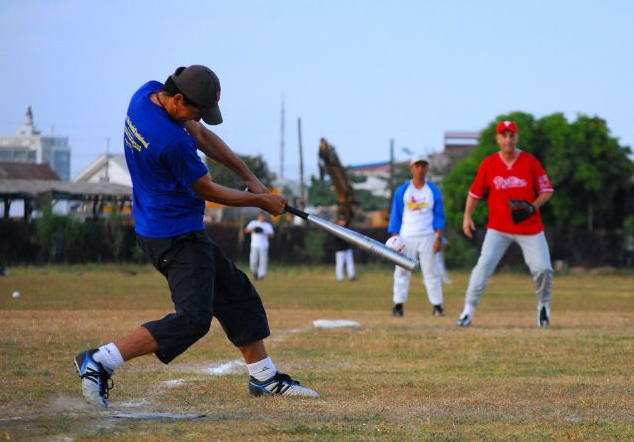 “Last weekend, Fastball, together with Johnny’s Fish and Chips, held the 1st Cebu Baseball Invitational. Four Cebuano teams from different social backgrounds competed: the Youth Phillies (composed mostly of Cebu International School students), the Children’s Shelter of Cebu Twins (made up of orphans and abandoned children), the Abellana National School Team and the H & B team of the Bacarisas Baseball Clan of Cebu. It was a huge success. The children experienced the thrill of winning and, yes, losing with grace. We need more of these tournaments to spark the interest in schools. “This summer, Fastball Batting Cages—sponsored by Alaska Milk’s Power Camp Program—will be holding a Baseball and Softball clinic. The program (open to boys and girls aged 6 to 16) will run from April 13 to May 1, Monday-Friday, 4 to 6 p.m. Thanks, Jesse. Because of your strong “If you build it… they will come” belief, this ballgame is back at bat. To learn more, you can contact Jesse at 0917-3222284.